Wellington Park in downtown Simcoe is a beautiful space with flowers cascading, cooling shade from mature trees and lots of green space – perfect for a giant tent and stage. This was July 29th and it was the celebration of local food and farmers throughout the county. Right on the cusp on Food Day Canada, over 200 people gathered and enjoyed a menu like none other. Thirty six dishes on the buffet table, each dish was created from the produce of a local farmer. It was an event put on by the Norfolk Rotary and Lions Club and the money always goes to a good cause. I was there selling The Ontario Table and all of the profits from my sales was going to the Norfolk Children’s Nutrition Network. The buffet table read like a geographical listing of Norfolk’s farmers. Dishes like Spicy Kernel Peanuts Hummus and Wagon Wheel Diakon Salad caught my attention. I took a bit from McClung’s Vegetable Platter, Kitchan’s Cabbage Salad and Fett’s All Red Fingerling Baby Potato Salad. The Lake Erie Perch from Knectel’s was deliciously fresh and the V.G. Packer’s Flattened Chicken was yummy. On the sweeter side there was a Norfolk Crisp that included apples from Cleaver’s, peaches from Matz’s and Saskatoon berries from Harmony Farms. Melons were from the Cider Keg and the star – Sweet Potato Bread Pudding was made from Ven Berlo’s sweet potatoes. Of course it all came together under the brilliant direction of Chef Heather Pond-Manorome of the Blue Elephant in Simcoe – great job Heather. The event is in it’s second year so look for it next year. By the end of the 3-hour dinner, I’d raised over $300 through the sale of The Ontario Table for the Norfolk Children’s Nutrition Network. A great example of how local food works! Went for a ride with Cheryl Barnes of Inn The Pines Market, in St Catharines. Cheryl runs one of the more popular farm markets in the region. She grows lots of vegetables on her 14-acre farm and for the rest, she gets fresh produce directly from large farms – right from the sorting tables, now you can’t get much fresher than that! On her farm, Cheryl grows garden veggies like celery, 30 types of tomatoes, 10 types of peppers, cauliflower, zucchini, and more. In addition to her vegetables, Cheryl raises chickens for eggs, cattle for beef and pigs for pork. Her friend, Dale Cable fishes and Cheryl sells fresh frozen perch from her stand. Cheryl’s a great foodie. All summer long she’s putting food away like corn for winter corn bread or corn chowder. She has her pork bones smoked for winter dishes like soups and stews. Today I’m shopping for the market with Cheryl and our first stop is at Pleasant Berry Blueberry Farm in Brantford. Tony and Grace Gdyczynski run the 2.5 blueberry patch. He’s been growing blueberries for too long, he thinks 16 to 17 years. I have refrigerator of blueberries at home and I can’t resist buying more, They’re ultra sweet and bursting with blueberry flavor. It’s both a U-Pick as well as ready picked. It’s a very neat and pretty little patch. We load up Cheryl’s truck with blueberries before heading to the next farm. Next stop was Welsh Brothers. Peter and brother Wayne are 3rd generation to farm this land with their children. We go from the office barn and drive out to the corn patch that is being harvested. We pass asparagus fields and pumpkin patches and more corn fields. They grow 500 acres of premium sweet corn and pick 5 acres a day. Planting different varieties of corn at different times insures a continual corn harvest until – weather permitting, Thanksgiving. Out at the field, the picking machine is hard at work. We climb on board. Five to six workers pick furiously in the field and throw the corn into a suspended hopper that leads through the field. From the hopper a conveyor belt moves the corn to the sorting and packing line where another eight workers sort the corn and bag it. The bags are then piled high in a trailer that is pulled behind the sorting line. The full trailers now go to the barn that houses 6 cooling rooms. Three to four trailers fill one room and the corn is rained on with ice water until the internal temperature reaches a very low temperature. This stops the conversion of sugar to starch and keeps the corn tasting fresher longer. We pass another cornfield that’s being irrigated with well water. Peter loves sweet corn but admits to being a traditionalist. He likes to boil it, but if he’s hungry in the field, he’ll eat it raw. Of course the only corn you can eat raw is fresh local corn. For Peter, sweetcorn can be an entire meal and he loves eating it cold the next day. Both Peter and Cheryl lament consumers tendency to pull back the corn husks and leave the corn because the rows of kernels aren’t perfectly straight. In fact corn kernels are seldom perfectly straight and when striped corn is tossed aside, no one else wants it either and the farmer looses. Food, like people is far from perfect, but it’s still good! Both encourage their customers to know their food and their farmer. Next stop was Steve and Paula Fett, Fett Farms and they grow lots of potatoes; red, white and yellow. Now they’re growing gourmet fingerling potatoes from Russian, Pink and French to All Blue and White Creamers. Fett is a large enough farmer to sell to grocery chains so look for them in the grocery stores. It may be a simple thing but Steve puts his red potatoes in red bags, yellow flesh in yellow bags and white potatoes in white bags. It’s a great way to spot Fett potatoes. On the Fett farm they have a sorting table, washing station and cold storage for their potatoes are available year round – or until they last. Steve explains one of the biggest potato myths is if you wash potatoes, they won’t keep. They do, the secret to storing potatoes is a constant cool storage temperature. They’ll keep very well in a cold cellar but rarely will they keep under a sink (apparently this is where most people store potatoes). With a quick lunch at Harmony Bakery we were off to Berkel’s Greenhouse for beefsteak tomatoes. The 8-acres of greenhouse Ted Berkel grows some cocktail and yellow tomatoes as well as his mainstay – beefsteak. Cheryl buys the large tomatoes that don’t fit into shipping flats. I guess you could call them the rejects, but they’re the perfect size for a thick slice of crusty Italian-style bread. Rub the bread with garlic and lay one thick slice of tomato on top with a bit of salt. Options are a bit of mayo and shredded basil leaves – it’s the quintessential summer meal! We were done our day of shopping at farms, Cheryl had enough food to stock her shelves and I had enough to share with my neighbours. There’s lots of fresh produce out there right now, get out there and find your fill. When I think of Muskoka my mouth automatically begins to salivate for some of Ontario’s most succulent beef, luscious maple syrup and of course a martini made with one of chef Rory Golden’s pickled wild leek stir sticks. 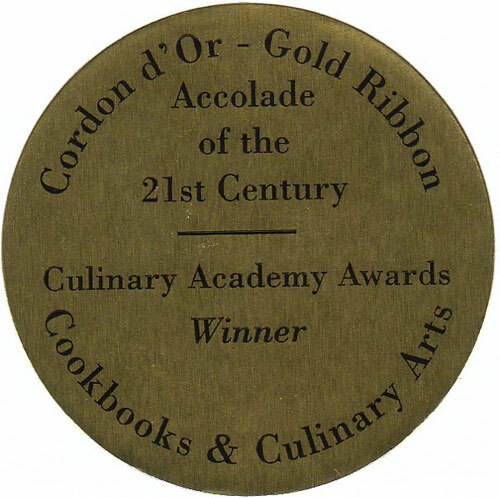 Golden is the executive chef of the Deerhurst Resort in Huntsville (www.deerhurstresort.com) and one of Muskoka’s most vocal local food advocates. Chef Rory is the talent behind the Field to Fork event held August 14th (www.savourmuskoka.com). The format is quintessential farm and country with gourmet food tastings on a farm for the country low price of $65 a head. There is an amazing farmers market in Gravenhurst at the Muskoka Warf. A double row of market vendors form a giant circle and shoppers meander around smelling the freshness and scooping up the seasons bountiful harvests. 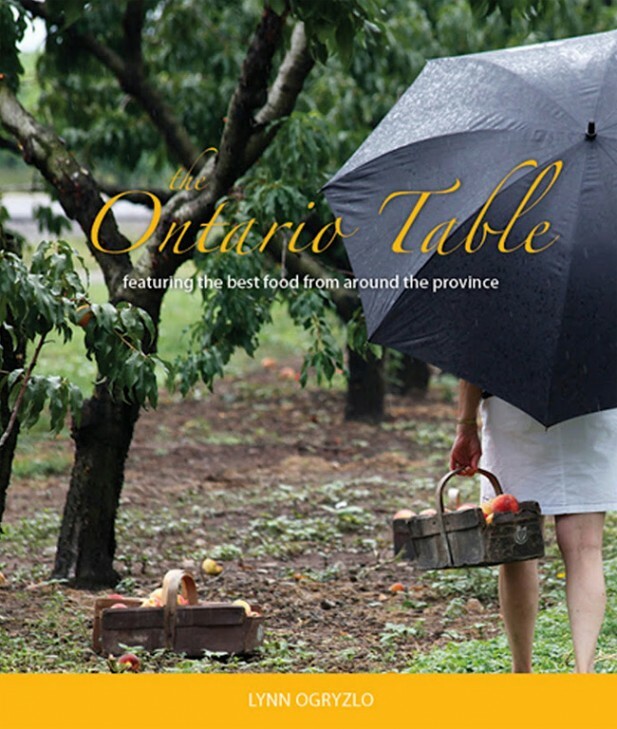 I was there promoting local food with my new book, The Ontario Table. Every book purchased earns a signature on the Ontario Table-cloth. As I travel across Ontario collecting signatures, it will surely be the longest tablecloth in support of local food. Chefs sign in red, farmers in green and locavores in black. At the end of the season I will roll it out and plan a huge feast where we’ll all sit around and read what everyone has written about local food. Keep posted on my blog for more info. There is T & R Family Farm from Niagara-on-the-Lake with the seasons first cherries. Muskoka doesn’t grow cherries so the giant table of red and white juicy berries go quickly. It’s garlic scape season and you can overhear many conversations about delicious garlic scape dishes. 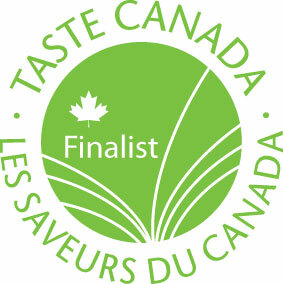 Today is a special day and Savour Muskoka is offering tastings of what is growing in Muskoka. Reed of Muskoka Meats is serving up delicious venison sausages, Black River Food Co is offering a beer, bacon and sausage soup. Strawberries play centre stage with mini strawberry shortcakes – fresh from the fields. Huntsville seems to be the regions hot spot for resorts. In addition to the all season Deerhurst Resort, Taboo (www.tabooresort.com) is a luxury resort, golf course and spa. The new chef there is Andy Dymond, former chef of the Prince of Wales Hotel in Niagara and another chef in love with food that grows near and around him. Can’t wait to visit and try his version of Muskoka cuisine. While there is no competition among the great chefs of Muskoka , there is great fun for foodies to graze around Gravenhurst, Bracebridge, Huntsville, Bala and Port Carling tasting and experiencing it all. I love the little town of Bala, so pretty, so quaint. It’s the cranberry capital of Ontario and it’s worth taking in the festival every October (www.balacranberryfestival.on.ca). If you can’t make the festival, drive to Johnston’s Cranberry Marsh for everything cranberry you can imagine from fresh (frozen) to dried, juice – yes even wine from Muskoka Lakes Winery. In Bracebridge, Marty’s is the hip place to be. Find a table among the locals and feast on his take out counter. I’ve never seen pies so big and abundant with juicy fruit that it inspires a direct face plant. The ice cream is just as exciting. Gravenhurst is home to Muskoka Meats, also known as the 100 Mile Store. Owner Dave Purdon stocks a great selection of small artisan food products from within 100 miles – or 160 km. Their specialty is local meat and a look in their meat counter has you drooling over ultra thick cuts of well-aged beef. Best to ask for what you want because most of the meat is out back reserved for the local carnivors who know exactly what they want. On the way home I discovered Fairdale Farm, went and met Kim Leatherdale who professes to be a new farmer in love with her new business and success. They sell beef, lamb and chicken. Freezers in the farm retail store carry a great selection of cuts and the honor box speaks to the trust in farm and country conviviality. You can find other farms across Ontario to visit at www.ontariofarmfresh.com.